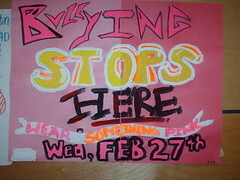 On February 25, 2009, boys and girls across Canada wore something pink to school in recognition of the country’s Anti-Bullying Day. Many countries celebrate student campaigns against traditional as well as cyberbullying. Below, Thomas Bridson (9th grade) wearing his official anti-bullying T-shirt, ties Kristin McEwen’s pink shoelaces on Canada’s 2009 Anti-Bullying Day. Students Travis Price and David Shepherd started the campaign in 2007 after witnessing bullies go after a boy who wore a pink shirt on the first day of school. Travis and David bought 50 pink T-shirts and tank tops to give their friends. The next day the school was a sea of pink. Their anti-bullying campaign has spread to 25 countries. Bullying is no longer limited to name-calling, physical harassment, or the more subtle methods of exclusion and rumor spreading. Now technology makes bullying possible through the Internet – emails, texting, instant messaging, and blogs. Cyberbullying is a global problem that has led to suicide (bullicide) and long-term mental health issues for its victims. If you are being harassed online, you might feel singled out and alone. But you’re not. Many kids experience some form of cyberbullying but keep it to themselves. That’s the worse thing you can do. Tell your parents, grandparents, school counselor or any adult you trust about what’s happening. At the very least, tell your friends so you don’t have to live with the fear and frustration alone. For help and more information about cyberbullying, take a look at www.wiredsafety.org. or www.netsmartz.org.